An update on Olympia’s continuing campaign to push back against gentrification and the City’s attempt at socially cleansing the downtown. The campaign to end an anti-homeless security patrol in downtown Olympia continues. 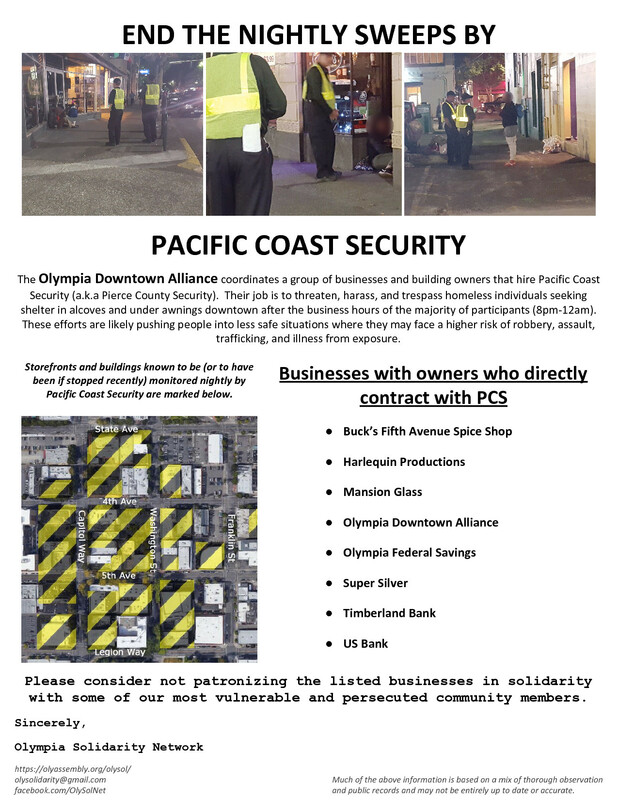 Dozens of business owners, property managers and building owners contract with Pacific Coast Security/Pierce County Security (PCS) in a scheme called the “Downtown Safety Team,” facilitated by “business advocacy” group, Olympia Downtown Alliance (ODA). PCS guards hired for this scheme perform nightly patrols from 8PM to 12AM and trespass and displace people sleeping in the alcoves or other parts of property owned by participating parties. These patrols have been effective in forcing people out of the rapidly gentrifying downtown core and into the peripheries of downtown, hence the ballooning encampments adjacent to Olympia Transit Center. 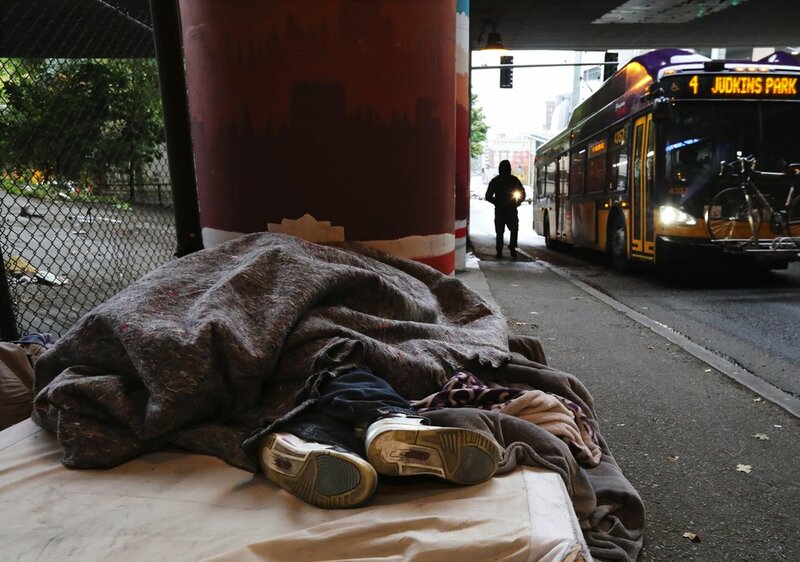 The 2018 Thurston County Homeless Census counted 763 un-sheltered people in the City of Olympia. This report also found 135 people using alcoves for overnight shelter in a nine by eight block area during the early morning of January 25, 2018. As cold and wet weather intensifies, it becomes ever more urgent to end the patrols and ensure increased sleeping options for homeless individuals. After 50 demonstrators confronted PCS guards and shut down the patrol on October 4th, nightly patrols were temporarily suspended. Patrols resumed nine days following the disruption, on October 13th, after PCS, the Olympia Downtown Alliance (staff and members) and Olympia Police Department met and discussed the Oct. 4th action. While this protest yielded important tangible gains, it was also met with repression from the police. 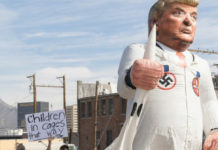 One alleged protester was later arrested on trumped-up felony charges, while in the days after other alleged attendees of the demonstration were, followed, surveilled and generally intimidated by officers. Despite these attempts to quell organizing efforts the campaign has proceeded. Here are some of the highlights. On the evening of Thursday, Nov. 1st, 25 Olympia Solidarity Network (OlySol) members and supporters staged a second disruption of the PCS nightly patrol. 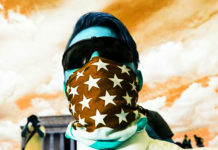 Dressed in costume and otherwise festive attire the group located and confronted the guards on State Ave, where the sidewalk was subsequently occupied and PCS were forced to stand in the street, unable to continue on their route. After a 30 minute standoff laced with verbal altercations, Olympia Police Department officers intervened and escorted PCS guards away from the scene, ending that night’s patrol. On most third Thursdays of each month, the Olympia Downtown Alliance coordinates promotional events for member businesses in an effort to boost downtown commerce. In front of the ODA’s info booth at Third Thursday, OlySol members and supporters distributed informational pamphlets about the ODA’s role in facilitating the anti-homeless security contracts. 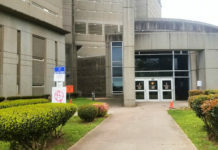 Hundreds accepted the pamphlets including consumers participating in Third Thursday and many expressed support for the campaign. A small crowd of OlySol members and supporters gathered for a mid-day rolling picket, targeting a number of businesses that contract directly with PCS. U.S. Bank, Timberland Bank, Olympia Federal Savings, the New Caledonia building (home to headquarters of the ODA) and Mansion Glass were all stops on the picket route. 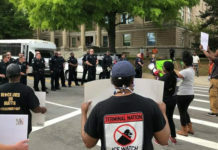 Protesters entered the lobbies of both U.S. Bank and Olympia Federal Savings, forcing their temporary closure, and Timberland Bank, upon notice of the impending protest, also locked their doors, while leaflets were distributed outside its entrances. A new poster campaign has been launched in Tacoma WA, where Pacific Coast Security/Pierce County Security is headquartered and where many of its contracts are held. A new revised poster about the nightly patrols in Olympia has also been distributed throughout downtown Olympia. During the Downtown for the Holidays events, co-hosted by Olympia Downtown Alliance, over 100 informational pamphlets and leaflets were distributed to the public about downtown homeless sweeps. 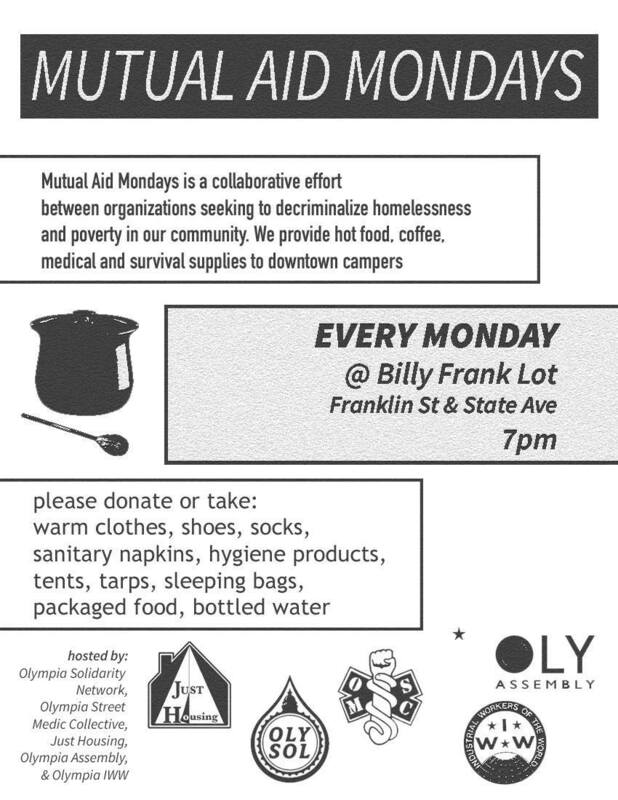 Separate but related to OlySol’s direct action campaign is the organization’s participation in the new Mutual Aid Mondays project. Mutual Aid Mondays is a collaborative effort between Olympia Assembly, Just Housing, Olympia Street Medic Collective, Olympia Industrial Workers of the World and OlySol. The project convenes every Monday evening at the State/Franklin homeless encampment across from Olympia Transit Center to distribute food, clothing and medical and hygiene supplies to over 100 downtown campers in the area. While already successful in helping meet basic subsistence needs, more work must be done to make the distribution site explicitly political. Mutual aid must be central to our strategic orientation. Mutual aid projects can meet material needs, expose the inabilities of the market and the state to mitigate inequalities and strengthen personal and political relationships across a range of differences. As social services are gutted, homeless and other marginalized populations are increasingly vulnerable and susceptible to the pressures of displacement. 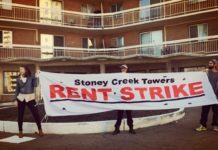 By filling a resource void left by the state, mutual aid projects can become a form of direct resistance to displacement.